Intellectual disabilities are neurodevelopmental disorders characterized by significantly impaired intellectual and adaptive functioning. Intellectual disability is characterized by an intelligence quotient ( IQ ) score below 70 as well as deficits in two or more adaptive behaviors that affect everyday life. These characteristics became apparent in childhood or adolescence. Intellectual disability can be either syndromic (the intellectual deficits are associated with other medical and behavioral signs and symptoms) or non-syndromic (the intellectual deficits appear without any other abnormalities). Among children, 30% to 50% of intellectual disabilities are of unknown cause. Genetics, events during pregnancy, and environmental factors are all thought to be possible contributors. Currently, there is no “cure” for an intellectual disability. However, with appropriate support and teaching, many individuals can learn to live fulfilling, productive lives. intelligence quotient: A score derived from one of several standardized tests designed to assess human intelligence. Down syndrome: A genetic disorder caused by the presence of all or part of a third copy of chromosome 21, associated with physical growth delays, certain characteristic facial features, and mild to moderate intellectual disability. neurodevelopmental: Related to the growth and development of the brain or central nervous system. An intellectual disability is a generalized neurodevelopmental disorder characterized by significantly impaired intellectual and adaptive functioning. It is defined by an intelligence quotient (IQ) score below 70 in addition to deficits in two or more adaptive behaviors that affect an individual’s everyday life. Intellectual disability was known as “mental retardation” until the end of the 20th century. However, this term is now widely seen as disparaging, so “intellectual disability” is preferred by advocates and researchers in most English-speaking countries. In addition, while the definition of intellectual disability once focused almost entirely on cognitive ability, it now also addresses both mental functioning and functional skills. As a result, a person with an unusually low IQ may not necessarily be considered intellectually disabled. Intellectual disability can be either syndromic (in which intellectual deficits are present along with other medical and behavioral signs and symptoms), or non-syndromic (in which intellectual deficits appear without other abnormalities). Down syndrome and fragile X syndrome are examples of syndromic intellectual disabilities. evidence that the limitations became apparent in childhood or adolescence. In general, people with intellectual disability have an IQ below 70, but the diagnosis may also apply to individuals who have a somewhat higher IQ but severe impairment in adaptive functioning. Among children, 30% to 50% of intellectual disabilities are of unknown cause. Sometimes intellectual disability is caused by genetics—for example, an abnormal gene may have been inherited from the parents, or an error may have occurred during gene combination. The most prevalent genetic conditions include Down syndrome, Klinefelter’s syndrome, fragile X syndrome (common among boys), neurofibromatosis, congenital hypothyroidism, Williams syndrome, phenylketonuria (PKU), and Prader-Willi syndrome. Genetic factors in intellectual disabilities: Down syndrome is one of the more common genetic causes of intellectual disability. Intellectual disability can also result if the fetus does not develop properly during pregnancy. For example, a pregnant woman who drinks alcohol or who gets an infection such as rubella may have a baby with an intellectual disability. If the mother has a difficult labor or birth and the baby does not get enough oxygen, brain damage may lead to the development of an intellectual disability. Environmental factors, such as exposure to certain diseases (e.g., whooping cough, measles, or meningitis) or toxins (e.g., lead or mercury), can cause intellectual disability if medical care is delayed or inadequate. Iodine deficiency is the leading preventable cause of intellectual disability in areas of the developing world—it affects approximately 2 billion people worldwide. In addition, there are four broad areas of intervention that allow for active participation from caregivers, community members, clinicians, and of course, the individual(s) with an intellectual disability. These include psychosocial treatments, behavioral treatments, cognitive-behavioral treatments, and family-oriented strategies. Core components of behavioral treatments, for example, include working on language and social skills acquisition. There are also thousands of agencies around the world that provide assistance for people with intellectual disabilities, both state-run and privately run and both for-profit and non-profit. Such agencies include fully staffed residential homes, day rehabilitation programs that are similar to schools, programs and workshops that help people with disabilities obtain jobs, programs that support people with intellectual disabilities who have their own apartments, programs that assist parents who have intellectual disabilities with raising their children, and many more. Although there is no specific medication for intellectual disability, many people with such disabilities do have further medical complications and so may be prescribed several medications. For example, children with autism who also experience developmental delays may be prescribed antipsychotics or mood stabilizers to help with their behavior. However, use of psychotropic medications such as benzodiazepines in people with intellectual disability requires vigilant monitoring, as side effects are common and are often misdiagnosed as behavioral and psychiatric problems. Autism spectrum disorder is a neuro-developmental disorder characterized by impaired social communication and restricted or repetitive behaviors. Autism spectrum disorder (ASD), formerly referred to as autism, is a disorder of neural development characterized by a broad spectrum of social, communication, and behavior symptoms, evident in early childhood. ASD is considered to exist along a spectrum because each individual with ASD expresses the disorder uniquely and has varying degrees of functionality. Social impairments in children with ASD can be characterized by a distinctive lack of intuition about others. Infants with ASD show less attention to social stimuli and smile and look at others less often. Children with ASD may exhibit repetitive or restricted behavior, including stereotypy (repetitive movement), compulsive behavior, sameness (resistance to change), restricted behavior (limit in focus, interest, or activity), and self-injurious behavior. ASD affects information processing in the brain by altering how nerve cells and synapses connect and organize. How or why this occurs is not well understood, but it is thought that ASD has a strong genetic basis. The main goals when treating children with ASD are to lessen associated deficits and family distress, and to increase quality of life and functional independence. The most widely used therapy is applied behavior analysis (ABA). autism: Bio-neurological disorder observable in early childhood with symptoms of abnormal self-absorption, characterized by lack of response to other humans and limited ability or desire to communicate and socialize. synapse: The junction between the terminal of a neuron and either another neuron or a muscle or gland cell, over which nerve impulses pass. Autism spectrum disorder (ASD) describes a range of conditions classified as neuro-developmental disorders in the fifth revision of the American Psychiatric Association’s Diagnostic and Statistical Manual of Mental Disorders (DSM-5). The DSM-5, published in 2013, redefined the autism spectrum to encompass the previous (DSM-IV-TR) diagnoses of autism, Asperger syndrome, pervasive developmental disorder not otherwise specified (PDD-NOS), and childhood disintegrative disorder. These disorders are characterized by social deficits and communication difficulties, repetitive behaviors and interests, sensory issues, and in some cases, cognitive delays. Asperger syndrome was distinguished from autism in the earlier DSM-IV by the lack of delay or deviance in early language development. Additionally, individuals diagnosed with Asperger syndrome did not have significant cognitive delays. PDD-NOS was considered “subthreshold autism” and “atypical autism” because it was often characterized by milder symptoms of autism or symptoms in only one domain (such as social difficulties). In the DSM-5, both of these diagnoses have been subsumed into autism spectrum disorder. Autism spectrum disorders are considered to be on a spectrum because each individual with ASD expresses the disorder uniquely and has varying degrees of functionality. Many have above-average intellectual abilities and excel in visual skills, music, math, and the arts, while others have significant disabilities and are unable to live independently. About 25 percent of individuals with ASD are nonverbal; however, they may learn to communicate using other means. The DSM-5 characterizes ASD by two primary symptoms: impairments in social communication and fixated or restricted behaviors or interests and associated features. These deficits are present in early childhood (often by age 3) and lead to clinically significant functional impairment. Previously, in the DSM-IV-TR, impairments in social interactions and impairments in communication were considered two separate symptoms; however, these have been combined in the DSM-5. The restriction of onset age has also been loosened from three years of age (as per the DSM-IV-TR) to the “early developmental period,” with a note that symptoms may manifest later when demands exceed capabilities. Social impairments in children with autism can be characterized by a distinctive lack of intuition about others. Unusual social development becomes apparent early in childhood. Infants with ASD show less attention to social stimuli, smile and look at others less often, and respond less to their own name. Toddlers with ASD differ more strikingly from social norms; for example, they may show less eye contact and turn-taking and may not have the ability to use simple movements to express themselves. Individuals with severe forms of ASD do not develop enough natural speech to meet their daily communication needs. Stereotypy—repetitive movement, such as hand flapping, head rolling, or body rocking. Compulsive behavior—exhibiting intention to follow rules, such as arranging objects in stacks or lines. Sameness—resistance to change; for example, insisting that the furniture not be moved or sticking to an unvarying pattern of daily activities. Restricted behavior—limits in focus, interest, or activity, such as preoccupation with a single television program, toy, or game. Self-injury—movements that injure or can injure the person, such as eye poking, skin picking, hand biting, and head banging. While specific causes of ASD have yet to be found, many risk factors have been identified in the research literature that may contribute to its development. These risk factors include genetics, prenatal and perinatal factors, neuroanatomical abnormalities, and environmental factors. It is possible to identify general risk factors, but much more difficult to pinpoint specific factors. ASD affects information processing in the brain by altering how nerve cells and their synapses connect and organize; thus, it is categorized as a neuro-developmental disorder. The results of family and twin studies suggest that genetic factors play a role in the etiology of ASD and other pervasive developmental disorders. Studies have consistently found that the prevalence of ASD in siblings of children with ASD is approximately 15 to 30 times greater than the rate in the general population. In addition, research suggests that there is a much higher concordance rate among monozygotic (identical) twins compared to dizygotic (fraternal) twins. It appears that there is no single gene that can account for ASD; instead, there seem to be multiple genes involved, each of which is a risk factor for part of the autism syndrome through various groups. It is unclear whether ASD is explained more by rare mutations or by combinations of common genetic variants. 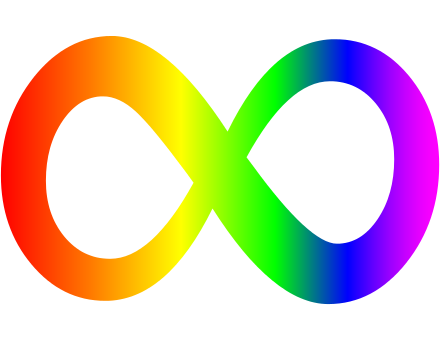 The diversity of the autism spectrum : The rainbow-colored infinity symbol represents the diversity of the autism spectrum as well as the greater neurodiversity movement. The neurodiversity movement suggests that diverse neurological conditions appear as a result of normal variations in the human genome. It challenges the idea that such neurological differences are inherently pathological, instead asserting that differences should be recognized and respected as a social category on a par with gender, ethnicity, sexual orientation, or disability status. A number of prenatal and perinatal complications have been reported as possible risk factors for ASD. These risk factors include maternal gestational diabetes, maternal and paternal age over 30, bleeding after first trimester, use of prescription medication (such as valproate) during pregnancy, and meconium (the earliest stool of an infant) in the amniotic fluid. While research is not conclusive on the relation of these factors to ASD, each of these factors has been identified more frequently in children with ASD than in developing youth without ASD. Evidence for environmental causes is anecdotal and has not been confirmed by reliable studies. In the last few decades, controversy surrounded the idea that vaccinations may be the cause for many cases of autism; however, these theories lack scientific evidence and are biologically implausible. Even still, parental concern about a potential vaccine link with autism has led to lower rates of childhood immunizations, outbreaks of previously controlled childhood diseases in some countries, and the preventable deaths of several children. There is no known cure for ASD, and treatment tends to focus on management of symptoms. The main goals when treating children with ASD are to lessen associated deficits and family distress and to increase quality of life and functional independence. No single treatment is best, and treatment is typically tailored to the individual person’s needs. Intensive, sustained special-education programs and behavior therapy early in life can help children acquire self-care, social, and job skills. The most widely used therapy is applied behavior analysis (ABA); other available approaches include developmental models, structured teaching, speech and language therapy, social skills therapy, and occupational therapy. There has been increasing attention to the development of evidenced-based interventions for young children with ASD. Unresearched alternative therapies have also been implemented (for example, vitamin therapy and acupuncture). Although evidence-based interventions for children with ASD vary in their methods, many adopt a psychoeducational approach to enhancing cognitive, communication, and social skills while minimizing behaviors that are thought to be problematic. ADHD is a developmental disorder characterized by inattention, distractibility, impulsivity, and hyperactivity. The DSM-5 indicates three subtypes of ADHD: (1) ADHD, Predominantly Inattentive Type; (2) ADHD, Predominantly Hyperactive-Impulsive Type; and (3) ADHD, Combined Type, which is a combination of the two other subtypes. General symptoms of ADHD include impulsivity, forgetfulness, inability to concentrate, impatience, thrill-seeking, excessive daydreaming, restlessness, and unusual/disruptive sleep patterns. The cause of ADHD is unknown, but most researchers agree that it is an interaction between genetic and environmental factors. While there is no known cure for ADHD, there are several treatment approaches that can manage symptoms. ADHD management usually involves some combination of therapy, medication, and deliberate lifestyle change. The ADHD diagnosis continues to be very controversial. Critics argue that ADHD is highly over-diagnosed, leading to stigmatization of the diagnosis and creating significant barriers for individuals who “legitimately” have the disorder. Attention-deficit/hyperactivity disorder (ADHD) is a neurodevelopmental psychiatric disorder characterized by a constant pattern of inattention and/or hyperactive and impulsive behavior that interferes with normal functioning. The first person to describe a version of ADHD was physician Heinrich Hoffmann, in the 1920s. The first official recognition of the disorder was “attention deficit disorder with and without hyperactivity,” in the DSM-III (published in 1980). Revisions to the DSM eventually renamed the disorder as attention-deficit/hyperactivity disorder (ADHD). Despite being the most commonly studied and diagnosed psychiatric disorder in children and adolescents, the cause in the majority of cases is unknown. The World Health Organization estimates that it affected about 39 million people as of 2013. It affects about 6%–7% of children when diagnosed using the earlier DSM-IV criteria; the incidence is about three times higher in boys than in girls. Approximately 30%–50% of children diagnosed with ADHD continue to experience symptoms as adolescents and adults. ADHD continues to be very controversial and has elicited the input of parents, clinicians, teachers, policymakers, and even the media. Many critics argue that it is highly over-diagnosed, leading to stigmatization of the diagnosis and creating significant barriers for individuals who “legitimately” have the disorder. Children with diagnoses of ADHD are often judged as lazy and unfocused by choice. This over-diagnosis has led to a colloquial use of the term “ADHD” among children, adolescents, and adults alike, to indicate a general tendency toward distractibility and inattention. General symptoms of ADHD include inattention, hyperactivity (restlessness in adults), disruptive behavior, impulsivity, forgetfulness, inability to concentrate, impatience, thrill-seeking, excessive daydreaming, and unusual/disruptive sleep patterns. Academic difficulties and problems with relationships may be frequent. The symptoms can be difficult to define, as it is hard to draw a line between normal levels of inattention, hyperactivity, and impulsivity and significant levels that require intervention. As a result of sometimes-unusual patterns in thought processing, children with ADHD may be very creative and/or able to grasp big-picture concepts more quickly. Many people with a diagnosis of ADHD are very successful; however, the disorder can make academic and work performance more challenging. ADHD and academic performance: Many children with ADHD are unable to pay attention at school, leading to poor academic performance and sometimes isolation from peers. ADHD, Predominantly Inattentive Type (ADHD-PI): Symptoms include being easily distracted, forgetful, or disorganized; excessive daydreaming; poor concentration; and difficulty completing tasks. Often people refer to ADHD-PI as “attention deficit disorder” (ADD); however, the latter has not been officially accepted since the 1994 revision of the DSM. Children with the inattention subtype are less likely to act out or have difficulties getting along with other children. ADHD, Predominantly Hyperactive-Impulsive Type (ADHD-PHI): Symptoms include excessive fidgetiness and restlessness, hyperactivity, difficulty waiting or remaining seated, immature behavior, and sometimes destructive behaviors. Hyperactivity symptoms tend to go away with age and turn into “inner restlessness” in teens and adults with ADHD. ADHD, Combined Type is a combination of the two other subtypes. Most children with ADHD have the combined type. To be diagnosed per DSM-5, at least six out of nine symptoms of inattention, hyperactivity-impulsivity, or both must be present for at least six months and to a degree that is much greater than others of the same age. To be considered, the symptoms must have appeared between the ages of 6 and 12 and must be observed in more than one environment (such as at home, at school, or at work). The signs must be inappropriate for a child of that age, and there must be evidence that it is causing social, academic, or work-related problems. The cause of ADHD is unknown and still being heavily researched. Most researchers agree that it is an interaction between genetic and environmental factors, as is the case with most psychiatric disorders. Some cases of ADHD are related to previous infections or neurological trauma. Genetics determine about 75% of all ADHD cases, as the disorder is highly inheritable. A number of genes seem to be involved, many of which affect dopamine transporters. Environmental factors are also thought to play a significant role in the development of ADHD. Ingestion of alcohol or tobacco during pregnancy can affect central-nervous-system development and can increase the risk of offspring developing the disorder. ADHD is more common in children of anxious or stressed parents, and so some argue that ADHD is an adaptation that helps children face a stressful or dangerous environment with, for example, increased impulsivity and exploratory behavior. ADHD has also been linked to excessive television watching at an early age. While there is no known cure for ADHD, there are several treatment approaches that help to manage its symptoms. ADHD management usually involves some combination of therapy, medication, and deliberate lifestyle change. While treatment may improve long-term outcomes, it does not entirely eliminate negative outcomes. Medications are only recommended as a first-line treatment in children who have severe symptoms and may be considered for those with moderate symptoms who fail to improve with counseling. Common medications include psychostimulants and some antidepressants; however, medicating children is a controversial issue because of drugs’ ability to interfere with normal development. Dietary modifications may also be of benefit, with evidence supporting the use of fatty acids and reduced exposure to food coloring. A low-carbohydrate diet can help keep blood sugar stable, which in turn helps with mood stability. Active exercise, similarly, can help keep mood stable; some balance-improving techniques may have an effect on the hypothalamus that can help with the ability to focus on tasks. Specific learning disorder includes difficulties in general academic skills, specifically in the areas of reading, mathematics, or written expression. Specific learning disorder is a classification of disorders in which a person has difficulty learning in a typical manner within one of several domains. Types of learning disorders include difficulties with reading ( dyslexia ), mathematics ( dyscalculia ), and writing ( dysgraphia ). The causes of learning disabilities are not well understood; it is thought that genetics, problems during pregnancy or birth, or environmental factors after birth may be involved. Depending on the type and severity of the disability, interventions and technology may be used to help the individual learn strategies that will foster future success. dyslexia: A learning disability characterized by trouble reading despite normal intelligence. Also known as reading disorder. dyscalculia: Difficulty in learning or comprehending arithmetic, such as difficulty in understanding numbers, learning how to manipulate numbers, and learning mathematics-related facts. dysgraphia: A deficiency in the ability to write, primarily in terms of handwriting or coherence. Specific learning disorder is a classification of disorders in which a person has difficulty learning in a typical manner within one of several domains. Often referred to as learning disabilities, learning disorders are characterized by inadequate development of specific academic, language, and speech skills. Types of learning disorders include difficulties in reading (dyslexia), mathematics (dyscalculia), and writing (dysgraphia). Dyslexia, sometimes called reading disorder, is the most common learning disability; of all students with specific learning disabilities, 70%–80% have deficits in reading. The term “developmental dyslexia” is often used as a catch-all term, but researchers assert that dyslexia is just one of several types of reading disabilities. A reading disability can affect any part of the reading process, including word recognition, word decoding, reading speed, prosody (oral reading with expression), and reading comprehension. The term “dysgraphia” is often used as an overarching term for all disorders of written expression. Individuals with dysgraphia typically show multiple writing-related deficiencies, such as grammatical and punctuation errors within sentences, poor paragraph organization, multiple spelling errors, and excessively poor penmanship. Dysgraphia: Dysgraphia is often characterized by grammatical and punctuation errors within sentences, poor paragraph organization, multiple spelling errors, and excessively poor penmanship. The diagnosis of specific learning disorder was added to the DSM-5 in 2013. The DSM does not require that a single domain of difficulty (such as as reading, mathematics, or written expression) be identified—instead, it is a single diagnosis that describes a collection of potential difficulties with general academic skills, simply including detailed specifiers for the areas of reading, mathematics, and writing. Academic performance must be below average in at least one of these fields, and the symptoms may also interfere with daily life or work. In addition, the learning difficulties cannot be attributed to other sensory, motor, developmental, or neurological disorders. heredity. Learning disabilities often run in the family—children with learning disabilities are likely to have parents or other relatives with similar difficulties. problems during pregnancy and birth. Learning disabilities can result from anomalies in the developing brain, illness or injury, fetal exposure to alcohol or drugs, low birth weight, oxygen deprivation, or premature or prolonged labor. accidents after birth. Learning disabilities can also be caused by head injuries, malnutrition, or toxic exposure (such as to heavy metals or pesticides). Individuals with learning disorders face unique challenges that may persist throughout their lives. Depending on the type and severity of their disability, interventions and technology may be used to help the individual learn strategies that will foster future success. Some interventions can be quite simple, while others are intricate and complex. Teachers, parents, and schools can work together to create a tailored plan for intervention and accommodation to aid an individual in successfully becoming an independent learner. School psychologists and other qualified professionals often help design and manage such interventions. Social support may also improve learning for students with learning disabilities.